« Produce spotlight: Berries, pineapples, and more! 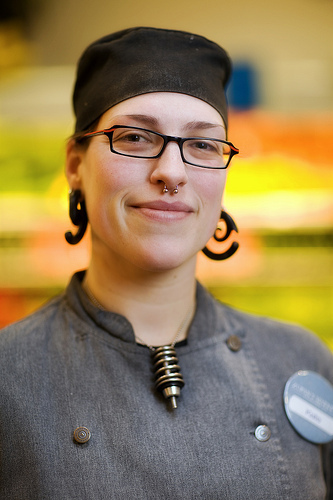 If you’ve wandered into the deli portion of our Burnside location, you’ve likely seen the array of specialty soups made daily by our resident soup queen, Kate. We talked to Kate this week to get some of her secrets on what makes her soups special and how you, our readers, can make some awesome soups at home with Zupan’s salads as the base! Zupan’s: What’s your cooking background? Kate: I never went to school to learn how to cook but I’ve been cooking for a living for the last 8 years. I worked at a retirement center for 3 years and at lots of pizza places and just kept getting opportunities to learn. I had a lot of bosses nicely tell me that my food looked awful and it was time to start over. So really, I’ve just learned from my mistakes along the way. I didn’t get any of my talent from my mom, like some people might think. Instead, my mom now asks me where and how I got my skill. Zupan’s: Is soup your specialty? Kate: I like to cook a lot of different things, but yeah, soup is my specialty. Zupan’s: What are some of your secret soup making tips? Kate: Horseradish and a horseradish blend is your friend. I add it to almost every soup. Don’t put a lid on soaking beans. They’ll expand and it can be extremely messy to clean up. Zupan’s: Can you share some soup ideas for our readers to make at home? Kate: I have some great “cheat” ideas that will help cut cooking time in half at home. They all include buying some of our salads at Zupan’s, and using them as a base for whatever soup you want. These salads are found at all 3 of our stores. 1) Beet & pepper salad: Buying this and making a borscht out of it is a great idea – the beets are already cooked for you! 2) Sweet curry couscous salad: This is a great base for a vegetarian soup or you could easily add chicken to it for a flavorful meal. 3) Curry tofu with rice salad: All you need to do is add some broth to this salad and you’re done! 4) Five bean salad: This is a great base for chili or a bean & bacon soup. The beans are already cooked and seasoned for you! If Kate has got your stomach rumbling, what are you waiting for? Stop in and try some of her creations and you’ll see why she’s the queen of all things soup. Or, pick up one of our fresh-made salads as a soup base and see if you can channel your inner soup goddess to make a memorable homemade soup. You made the best potato chowder, ever! I was just getting over strep throat and I needed some help, thanks so much!!! I want the recipe!